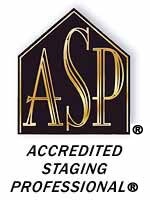 As an Accredited Staging Professional, I'm pleased to offer home staging services throughout Utah and Salt Lake County. Staging is the art of professionally preparing your home for sale using proven creative techniques in order to appeal to the broadest number of potential buyers. Statistics show professionally staged homes generate higher sales prices and reduce the amount of time a home is on the market. Let me help you make your home even more beautiful while maximizing your profits! As an ASP REALTOR, outrageous service and integrity characterize the way I do business. I can't wait to help you STAGE your home to sell fast and for the highest possible value. Click on "My Staged Properties" to view my current, staged listings and many past success stories. I specialize in the Wasatch Front Area. Call me today at 801-548-2716. Let's get started on your success story today! STAGING WORKS! And is a vital (yet often missing) element of your MARKETING STRATEGY! I have been priveliged to stage 100's of homes and have the staging and real estate experience and to make your home stand out and put you at the top of a buyer's short list. Call me today to get started - 214-926-8313.